Atlantic Language Dublin and Galway provides English language tuition for adult students, junior students (4 to 17 years) and families from all over the world. Atlantic Language also offers a programme of afternoon and weekend excursions and social activities. Details of the school management and coordination team are posted at each school site. Atlantic Language Dublin and Galway is committed to safeguarding the children in our care and to providing a safe environment. Atlantic Language Dublin and Galway believes that the welfare of the children attending our centres is paramount. We are committed to child-centred practice in all our work with children. The school is committed to upholding the rights of every child and young person who attends our centres, including the rights to be kept safe and protected from harm, listened to, and heard. Atlantic Language’s policy and procedures to safeguard children and young people reflect national policy and legislation and are underpinned by Children First: National Guidance for the Protection and Welfare of Children (2017), the TUSLA Children First – Child Safeguarding Guide (2017), and the Children First Act 2015. The school’s policy declaration applies to all teachers, administrative staff and interns: each must sign up to and abide by the policies, procedures and guidance encompassed by this policy statement and the Child Safeguarding Policy and accompanying procedures. Atlantic Language Dublin and Galway reviews its child safeguarding statement and accompanying child safeguarding policies and procedures every two years, in addition to any updates required following from changes in legislation or national policy. Atlantic Language has appointed Designated Liaison Persons (DLPs) at each of its sites. The role of a DLP is to act as a liaison with outside agencies and to be resource person to any staff member or who has child protection questions or concerns. Details of the Designated Liaison Persons are posted at each school site. This Statement has been published on the company website and is displayed in the company. It has been provided to all staff, volunteers and any other persons involved with our centres. It is readily accessible to parents and guardians on request. A copy of this Statement will be made available to TUSLA if requested. Atlantic Language Dublin and Atlantic Language Galway (Atlantic Language) is a provider of English language education programmes and services related to the teaching and learning English including, assessment and placement, examinations, research, accommodation, social activities and excursions. Atlantic Language is based in Ireland and provides services to clients internationally. This Data Protection Policy and Privacy Statement explains how Atlantic Language collects and uses personal data in the course of its business operations. The company is committed to the protection of our clients’ data in compliance with the General Data Protection Regulation (GDPR) and other legislation and is happy to respond to any questions or requests regarding data protection through our Data Officer (details below). Atlantic Language is a Data Controller. The company is registered in Ireland (IE319926) with a business address at Fairgreen House, Fairgreen Road, Galway, H91 AXK8, Ireland. Marketing preferences – such as your interests in and use of our products and services. You visit or use an Atlantic Language school site as a student or visitor. Because of our legitimate business interests. Send informational communications to you regarding our activities, products and services. We may conduct analysis on the data that we receive through the use of our websites, social media channels, products or services and report on this information for business purposes in a manner where personally identifying data is removed. Atlantic Language does not conduct automated data processing operations on personal data. Comply with the requirements of regulators, immigration or other governmental authorities or as required by law. Where we engage with third parties to provide products or services, we confirm that suitable and compliant controls are in place for the protection of personal data, and that data sharing is minimised to that which is required for the delivery of the services and products only. It is not normally necessary for Atlantic Language to transfer your data to another country. Data transfers within the European Union and European Economic Area (EU/EEA) are protected by the rights and responsibilities established the General Data Protection Regulation. If it is necessary to transfer personal data beyond the EU/EEA, we will ensure that there are suitable protections in place to ensure the security of the data that is transferred. Atlantic Language retains your personal data for the duration of our relationship and for a defined period of time after that, subject to legal requirements and obligations. If we hold data for longer we will anonymise it by removing all personally identifying information such as name, contact details. What are our retention periods? Contact/Mailing list membership – two years. You can ask us for a copy of the personal data that we hold about you. You can also ask us about how we collect, process or share your personal data. In addition, you can ask us to restrict the way we use your data, may ask us to update or to delete the data we already have. To exercise your rights you should contact the Data Officer (data.officer@atlantic.ac). We may be limited in some requests owing to legal or other public obligations placed on us. We will respond to requests and will explain any cases where we cannot complete what you have asked. In most circumstances there will be no fee for requests. Any questions or comments about the use of your personal data at Atlantic Language can be sent directly to the Data Officer (data.officer@atlantic.ac). We will investigate your questions and respond to you promptly. We may have to ask for some additional information from you to verify your identity so we can assist with your question. If you believe that we have not responded adequately to in a timely manner, you may contact the Data Protection Commissioner (Ireland – www.dataprotection.ie). Atlantic Language may update this Statement from time-to-time. The current version is available to be viewed at www.atlantic.ac/policies. This Statement updates and replaces all previous versions. Atlantic Language takes student attendance seriously as the school wishes to see all its students’ progress with their learning. Classes are scheduled according to the timetable advised to students and all students are required to attend their identified classes. Attendance is strictly monitored and recorded on a class-by-class basis by each class teacher. Attendances are recorded by the teacher at 15 minutes past the published start time for the class and are subject to spot inspections by members of the school Academic Office or Management. All attendance registers are reviewed fully and recorded electronically, together with class test results, on a weekly basis by the Academic Office and then secured for inspection by school regulators, inspectors or the immigration authorities. Breaches of attendance are escalated to the Academic Office. Atlantic Language Dublin and Galway will retain a record of all attempts to communicate with the student or their representative. Atlantic will endeavour to make contact with absent students by all reasonable means, including by SMS, email or by contact with their agents. Students are expected to attend classes on time. Late arrivals, leaving class during class periods or early departures are disruptive for the student’s own learning, and affect the continuity of the class for both their fellow students and the teacher. A teacher will refuse to readmit a student to the current class period where that student has been substantially absent. Students are strongly encouraged to have their language competence recognised by taking an internationally recognised and externally validated examination. Advice and details on these exams, including sample tests is available from the Academic Office team. Non-EU/EEA students taking Academic Year programmes are required to take one of the examinations (listed above) as part of their enrolment. At booking, students are required to choose the examination they wish to take at the end of their study programme. Students should be aware that some examinations take place on fixed dates only. Should a student wish to enter an examination for a specific date, they are advised to contact the Academic Office as soon as possible after arrival. Where a student has not selected a specific date, the school will automatically enter the student for the last available examination date during their booking. A school certificate is available to all students who complete a course. This certificate shows the course(s) taken, dates registered and the student’s final class level. Certificates will only be issued with details of the final level at which a student has studied. Certificates for students who are finishing courses and studies at Atlantic Language are available from the class teacher. Quality and Qualifications Ireland (QQI) is a state agency established under the Quality Assurance and Qualifications (Education and Training) Act 2012. The agency has a board which is appointed by the Minster for Education and Skills. The organisation brings together the roles of a number of previous organisations which had responsibility for the administration of training and education quality standards across further, higher and university education sectors. Accreditation and Coordination of English Language Services (ACELS) is a service of QQI which is responsible for the development and management of the inspection and recognition scheme for English Language Teaching organisations (ELTOs) in Ireland. Atlantic Language Dublin and Galway is regulated by ACELS and complies with the requirements of the inspection and recognition scheme operated by the organisation. Courses recognised by ACELS are indicated in school information. Atlantic Language has completed Quality Assurance, has worked with and successfully delivered further education and training programmes as part of the FETAC awards scheme. Atlantic Language maintains membership of a number of professional bodies and associations. These perform a supporting role in offering communication networks and for the sharing of knowledge and experience. They also offer opportunities for the effective pooling of resources. To reduce interruption to other students or disruption of classes, students are requested to refrain from mobile phone or other device usage except as directed by class teachers. Food is not permitted in classrooms at any time. Committing a violation of the law while a registered student at the school. There are specific arrangements for students undertaking the Academic Year Programme. Since 2015, the Academic Year Programme course duration has been 25 weeks with an entitlement of 8 weeks holidays. Students on this programme are eligible to work 40 hours per week from 1 May to 31 August. Students are also eligible to work 40 hours per week from the period 15 December to 15 January. To comply with regulations, students must identify their planned holidays schedule once they commence their course at the school. This information will be added to the student’s course programme and is notified to the GNIB or INIS. Holidays are permitted on a Monday to Friday (full-week) basis and may not be changed once notified to the school. Students with a visa require a letter from the school if they intend to leave Ireland for any holidays. This should be requested from Student Services at least one week before travelling. at least 14 days in advance. School holidays can only be taken on a Monday to Friday (full-week) basis. Holiday entitlements for students are given as follows. It is Atlantic Language’s objective to provide the best service in terms of tuition, accommodation and care for students. However, we know that from time-to-time the expectations that a student has may differ from the service received. These staff members will, firstly, attempt to find an informal solution to the matter raised. If this is not possible, the matter will be handled at a formal level, involving the student, school department and department managers necessary to find a mutually suitable solution. The school will endeavour to respond to the matters raised as promptly as possible and to keep the student informed. The school will also maintain a record of its attempts to resolve the matter raised. Where a matter cannot be resolved at a formal level with the department concerned, the school will escalate the process. This may involve engaging the student’s booking agents or other external bodies with the objective of finding an appropriate solution. In the case that no solution can be found through these approaches, the school will engage in external mediation through competent providers. Complaints and matters of concern regarding Junior, Group or Short-stay Group or Family programmes should be raised by the appropriate group leader (or parent) with their Programme Liaison Person or with the Centre Manager. Citizens of the EU/EEA benefit from the reciprocal obligations of the Irish health authorities to provide essential health services to recognised holders of a European Health Insurance Card. It is necessary for these students to provide evidence of entitlement to health care in another EU/EEA country. It is recommended that students contact the appropriate Health Authority in their home state before travelling to Ireland so that they can complete the registration for a European Health Insurance Card (EHIC). It is necessary to get this card before you depart your home state. Students from non-EU/EEA countries are required to pay for medical attention from their own funds. For this reason it is strongly advised that they obtain suitable medical insurance to cover any costs of emergency medical treatment as these costs may be high. Academic Year students and any students who must register with the Garda National Immigration Bureau (GNIB) will be required to show proof that they hold comprehensive medical insurance before they can register with the GNIB or before they can apply for a student visa. Officer or a member of the Student Services Team. They can make arrangements for a medical consultation. In accordance with the Qualifications and Quality Assurance (Education and Training) Act (2012), Atlantic Language provides financial protection to all enrolled students in the event that the school must close for any reason set out in the 2012 Act. 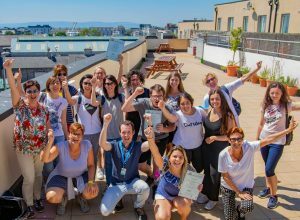 As Atlantic Language Dublin and Galway is a member of Marketing English in Ireland (MEI), it, together with other member schools espouse Learner Protection, thereby being able to guarantee to students that they will be able to complete all language courses for which they are enrolled. Fee payments, for which an applying student must provide evidence of payment for visa applications, are handled through an account independent of the school’s day-to-day business. This is done for the separation of payments and the protection of students. The operation of this account is subject to examination by Atlantic Language’s auditors and state regulators.